When I first heard the news that Barbadians had made a recent invasion in Hollywood, I was overjoyed as it was another step in making Barbados a major fashion hub on the world’s fashion map. I know very well that this isn’t the first time that Barbados has made a big impact in Hollywood with the likes of home girl superstar Rhianna dubbed the Queen of West Hollywood creating her big waves there. This more recently invasion however, was on March 9th during the bi-annual Concept LA Fashion Week for Fall/Winter 2013 at Siren Studios in Hollywood, Los Angeles. Two of Barbados top designers Kesia Estwick and Brandi Estwick took the runway by storm during the Caribbean Showcase leaving a very good impression with their collections Lilith and Iman Estie, respectively. These two young ladies did their country proud with their designs, getting some well-deserved international exposure as well as giving Barbadian models Sedia Jackman, Danielle Dottin, Charlene King and Danielle Bishop who accompanied them a feel of an international runway. The Lilith collection had structured tailoring, geometric cutouts and appliquéd details producing designs that were both bold and daring suitable for the woman who has plenty of attitude and dare-devil personality. The Iman Estie collection was the monochrome trend at its best as it featured cohesive black and white motifs. Her designs had a classic touch but were still very edgy and chic donning architectural inspired details and cutouts. Here’s a look at some of the designs from the collection…..
One thing I personally believe that can make any woman feel both feminine and powerful is a pencil skirt; its like a girl’s best friend plus it’s a timeless piece. Updating your silhouette and boosting confidence as they range from the classic cut to bold prints and fun designs. It transitions easily from day to night as the pencil skirt is such great multi-tasker perfect for day in the office, a night on the town and everything other occasion in between. Therefore, I’ve considered this a great investment piece and added it to my list of wardrobe staples as the pencil skirt can be easily glamed up or toned down. There are all kinds of variations of pencil skirts, long, short, higher waisted or very narrow; I prefer the ones that reach either just above the knee or mid calf. 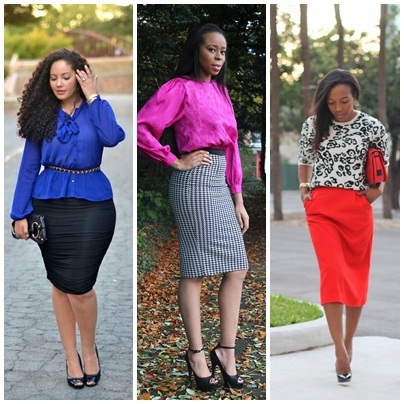 What’s your favorite pencil skirt look?